One of the last steps before storing the character in the library is to set the pivots for the different parts. 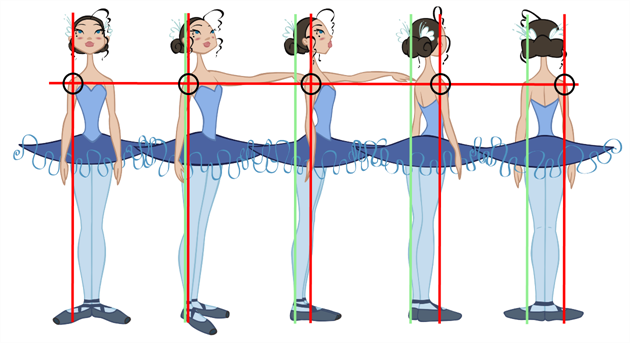 If you want the puppet's pieces to rotate correctly, you must set the pivot points right in the middle of an articulation, such as an elbow or a knee. By default, your master peg pivot is placed at the centre of the Camera view, which generally equates to your character's hips. A good way to set your peg's pivot is to move it between the character's feet. In the Camera or Timeline view, select the layer whose pivot you want to set. In the Camera view, you can also hold down Ctrl (Windows/Linux) or ⌘ (Mac OS X) and click on the piece whose pivot you want to set. NOTE: If you added other pegs to your rig, you must set their pivot using the same method.